Anyone been through lately? We plan on driving through early July with UK plates as long as we are allowed to. FCO advises no travel on the Georga / Russia border. We have not yet been through but will in August. I have good long term business contacts with a very reliable Georgian incoming travel agency and they say road and border is open with no problems. I will update you if they update me. Also driving on UK plates. Will you travel from this crossing to the Kazakhstan border? If so which route and overnight stops are you thinking of. We are looking at Stavropol and Astrakan for a couple of nights. Before pushing eventually on to Almaty or Bishkek . Hi Mark, I had a quick look at your website/blog. I live in Turkey and you will be fine driving through a large and beautiful country. Your biggest risk will always be other road users! I could not see clearly from the website map your intended route through Turkey. I am happy to offer advice/suggestions if you want. We shall be crossing into Georgia using the newly opened route near Lake Cildir. One of our favourite areas. The scenery is at its very best in June. We have used Posof before. Low key and friendly. The crossing on the coast will have a lot of trucks, though I do not know if this will slow down your crossing. Diesel is currently about 86p/l for eurodiesel (the one you should buy). You may see offers of really cheap diesel but if you love your engine -avoid those! Diesel may well be cheaper in Bulgaria than Turkey so fill up. In Georgia I expect it will be much cheaper than Turkey. karenandmike wrote: Hi Mark, I had a quick look at your website/blog. I live in Turkey and you will be fine driving through a large and beautiful country. Thanks for the offer and advice. Here is a better picture of my now planned route through Turkey. I'm stayng at a couple of campsites at the west and central parts of Turkey, then as I get closer to the Turkey/Georgia border I'll looking to start my first wild camp of the trek. Just to say to Rads, I've travelled from Russia to Georgia (through G. Military Highway) with my dog in 2015 without any problem. Hi Mark, the route looks fine until Erzurum. After that it follows a very twisty and mountainous road, when there are other easier options. The easiest and shortest (time-wise) route to the Georgian border from Erzurum is via Kars and Ardahan or Kars and Cildir depending on which crossing you use. If you have plenty of time then the twisty route might be a scenic option but all the area is scenic Unfortunately, the area near Gole (on your route) did experience some attacks last year FYI. If you take the Çildir crossing there are then two route options to Tiblisi. We shall take the more southerly route via Tsalka as we have done the Borjorni/Gori route, which may well be quicker. The Çildir crossing allows for a visit to Vardzia, which lies not to far off the route to Tiblisi, and is quite a tourist attraction. Feel free to ask any questions about places along the way in Turkey. Your route through Russia looks very like ours. Will you try to do the Russia section on a transit visa or tourist visa? Thanks for the heads up and advice with regard to fuel and prices - very much appreciated. 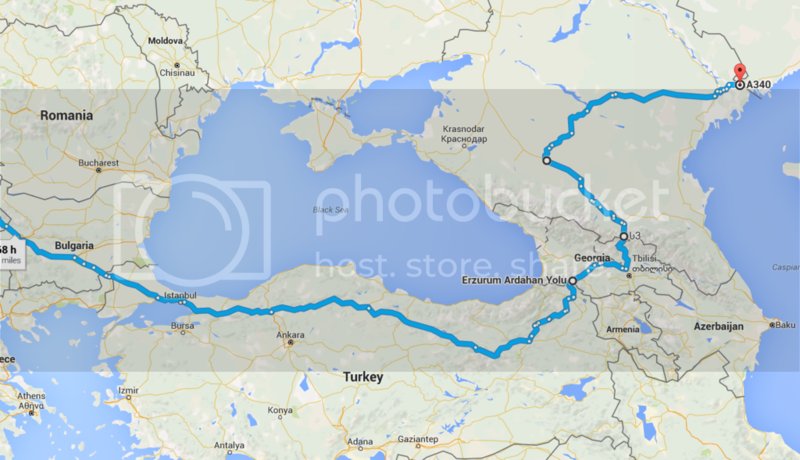 I have attached a pic below of my intended route through Turkey. I'm staying at a couple of campsites in the west, then as I get closer to the Georgian border I'll be wild camping. I'm intending to cross at Posof and work my way up to Larsi. Then like you head towards Stavrapol, and then over to Astrakhan (forgive my spellings). we will be checking out Istanbul and hopefully the Cappadocia surrounds along the way prior to the Georgia border crossing. Our itinerary is a day by day situation, i guess we would head to Vologograd to stand in the shadow of the giant lady the hill, then follow the Volga down Akstrakhan and check the delta out before hitting Kazakhstan. From there??? I was hoping to drive in a straight line through the Ural Sea, towards Kyrgyzstan. I have given up on Uzbekistan, the visa process is not worth the hassle no matter how much I want to go to Samarkind. Our main purpose for this trip is Altay/Altai, Tuva, Lake Bikal, Mongolia. everything else are added bonuses. I too will post an update once we have crossed the border. roro wrote: Just to say to Rads, I've travelled from Russia to Georgia (through G. Military Highway) with my dog in 2015 without any problem. That is great news. So far I had been unable to have that question answered. Great help, very much appreciated.